There are times in life when the ridiculousness of what is going wrong rises to a level where you just have to shake your head and grimly hang on. This was one such a moment. I could feel the blood rushing to my head as I thought about the financial train wreck that was about to happen — but the more immediate problem of getting Lorna to the hospital provided a sort of respite. Sometimes there are things that come along which just pretty much demand your full attention — this was one. So we piled into the car and navigated over to Delgado Hospital in Quezon City. It was an old, 1920’s era buildin, Spanish style with an open courtyard, with a helpful, competent atmosphere. One difference from America was that they weren’t at all into the “let the father into the room” kind of thing – so it evolved into much more of a 1950’s style “wait in the waiting room” kind ofr thing. This was before cellphones, so with little chance to communicate with the set, I found myself entering a little bubble as I started thinking sometimes about the prospect of another child–a very much unplanned one, but a child nonetheless–and sometimes about the economic ruin that was looming if I didn’t pull a rabbit out of the hat in the form of enough money to keep the production afloat for the next 21 days. The situation was that we needed P3M to get the film in the can and I had started with P1.5M (mine), and and expectation of P1.5M from a coproduction partner who had now tanked. Of the P1.5M I had started with, P1.3M or so was gone already before the first day of filming due to the heavy “front load” in which all the major actors had been prepaid, equipment deals prepaid, etc. So there was not even enough in the bank to meet the first week’s payroll, which would hit on Friday. So the first step was to come up with enough cash to cover that first payroll…that would get us into the second week of filming and it was just a three week shoot. Somehow I had to do it. I thought about going to Lito Abuevas, who had provided the P1.5M, but in the first instance I didn’t want to do that, and anyway he was out of the country scuba diving somewhere and there was no way to reach him. It would have to be some other way. Meanwhile — and gloriously –the baby came, a beautiful girl, an 8 pounder whom we named Kenny Michelle. Ironically, although I didn’t realize it at the time, having a daughter born on the first day of filming of my first film as producer would make it easy for me, from that moment on, to always be able to instantly know how long I’ve been making movies. I got to the set by around noon. It was strange in one sense, because I had hardly met anyone due to the “secrecy factor” that had required me to stay in hiding and let Ed Palmos, the director, do all the negotiations. The thought process behind that was that if this film somehow got labeled as an “American” (i.e. “Hollywood”) production rather than a homegrown Philippine one, there would be no way we could bring it in for the money we had (or thought we had) because everyone would expect more money. 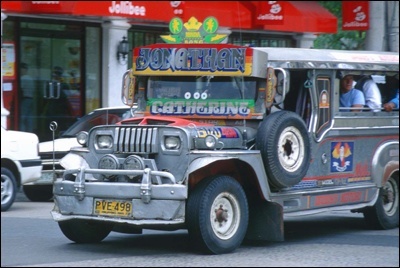 Photos: Philippine Jeepneys. Build to hold about 18 people, but the actual capacity is properly described as “one more”. Three of these were the basic transport for our entire crew on Umiyak Pati Langit. But now that all the deals were done, I was free to surface and by this time had met everyone, but didn’t really know them yet. At the time it seemed like a pretty solid, professional operation that was big enough to get things done, but small enough to do three company moves in a day. Looking back now, though, there was something better — it was ingenuously lean. There was a camera truck which had all lights and grip equpment and which towed the generator. The actors all provided their own dressing rooms — usually a big SUV, a van, or something like that. The crew rode around in 3 jeepneys, wardrobe had a jeepney, makeup did their work in the actors trailers, and all-in, including 5-6 actors at any given time, the total headcount on the set was less than 40. And you know what — the film looked pretty good, fully professional. Not that I got to spend much time on the set. From that first day, I learned what I would later come to describe as “production with a gun to your head”, as my life became a mad dash from one potential investor to another, begging, pitching, scrambling, and trying one way or another to feed money into the production account fast enough to keep checks from bouncing. I discovered that in the Philippines, once you’re in production and have stills to show, it is possible to get advances from the theaters so that was one of the first places I went, armed with old styled photo albums showing stills of the film-in-progress, and with the help of Jelly Cano, our booking agent, went down to Escolta in Chinatown where the theater bookers hold office, all in the same building (kind of like a permanent trade show). For the first week, it was the theater owners who got me through the payroll — and I could only thank Jelly (a wonderful 60 year old grandmother type who knew every single booker for every theater in the country) for opening doors and extracting the checks. Then I was on to my rich Filipino friends, trying to convince them to put money in to a Filipino movie, and I’ve got to tell you — this was pretty disheartening. The truth is, the entire Filipino film industry is built on the notion that the vast majority of moviegoers are C-D demographic types with little education and sophistication. Which means, among other things, that the elite of the country would rather be caught dead than be seen attending a Filipino movie. So the idea of investing in one was pretty hard to grasp. But somehow — and I have to be honest and say I don’t exactly remember how — I got us to the finish line and the film was in the can and bills were paid. We wrapped in early November — and had about three weeks to post the film and deliver it to the Metro Manila Film Fest. In the US, the fastest I could even imagine posting a film would be about 12-14 weeks, figuring at least 8 weeks to edit, and 4-6 weeks for sound, opticals, etc. Not so in the Philippines…..
We posted in a 1930’s era facility called Magna Tech in Quezon city which was a very comfortable place to work — in fact too comfortable, since just down the street were plenty of bars and restaurants and it was sometimes a problem keeping the editor working on the 15 hour a day schedule that was expected of him. I ended up having to spend a lot of time essentially being a security guard and keeping Ed Palmos (the director) and the editor sitting in front of the World War II era movieola on which they were editing. But again– somehow, we got it done. And then the sound — everything done in a matter of a few days in a cavernous sound stage where the sound was laid in and mixed just the same way it had been done back in the 1930’s — mag tape, live pass mixing. First we did a pass to balance the dialogue. Then a pass to balance effects and music, then the “real pass” to put everything in. The sound mixer was a legendeary Filipinos mixer, Rolly Ruta, who was just a joy to work with. He would get everything ready, throw the switch, mix forward until he either felt he’d made a mistake or until I tapped him on the shoulder, and then he would stop, rewind, then we would punch in, go forward, and keep pounding it. We finally the movie finished with, literally, minutes to spare before the clock struck 12 on submissions to the film festival. We were a “lock” to get into the festival, we were told, because of Ed Palmos’ reputation as a director, and because the film really depict major Filipino values, the depiction of which was the mission statement of the festival. And then another drama developed. It turns out, the year before, a film called “Olongapo – The Great American Dream” had won the festival. 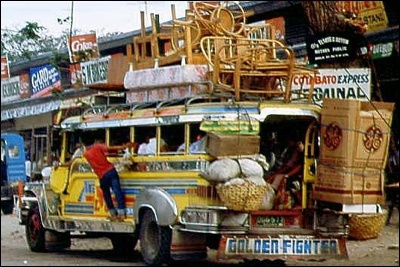 The film was a co-venture between some Americans and Filipinos and told a story that involved both Americans and Filipinos, although the main focus was on the Filipino side of the story. Well, the fact that Americans had won the previous festival had created what we would come to understand was a backlash, and in fact a new rule excluding any film with a non-Filipino producer from consideration. So … we were unceremoniously informed that our film was “out”. We appealed — but we lost the appeal. And then something equally strange a quirky happened. The week before our film came out, a film came out called “Maging Sino Ka Man” starring emerging bad-boy heartthrob Robin Padilla (think James Dean) and Pinay “megastar” Sharon Cuneta (think Drew Barrymore in style, with Julia Roberts market balue), and this film exploded — setting every box office record imaginable, due in part to the fact that rumors around Manila were ripe that Sharon and Robin were, in fact, “on” — meaning they were having a relationship which was huge, huge news in the gossip mad Manila environment. Okay, so what’s the big deal for our movie? Well, for starters, it meant that our 47 theaters became 35 as the demand for extensions for the Sharon/Robin megahit overwhelmed our film. This was a very ominous sign and we fought as hard as we could to hold onto every theater we could … but we still could only hold 35. And our secret weapon was that “megastar” Sharon Cuneta was the niece of our star Helen Gamboa, and “Tita Helen” was able to get Sharon to agree to not only come to the premiere, but to bring Robin with her. We of course leaked this through our publicist and the result was astonishing. On the night of the premiere, not only were all 4,000 seats filled, but there were another 5,000 people on the street outside watching the star arrivals. It turned out that somehow we had created the biggest movie premiere in memory in the Philippines. The screening began. I couldn’t sit still so I went out on the street, worked my way through the crowd and found someplace to grab a bite to eat. I sat, ate quietly, and could just feel the excitement and the possibility that we had engineered a giant hit. Never mind that we only had 35 theaters — that would be enough, and with great numbers we could expand that the next week. I went back to the premiere and walked quietly into the back of the theater, walking perhaps twenty rows into the theater, picking my way past a number of people who were sitting in the aisles. Again — an unforgettable moment. The film is a tearjerker, and by the time you get to the last 20 minutes there is plenty going on that will in fact extract tears from any empathic filmgoer, particularly Filipino drama fans who have a history of warming to this type of story. What I heard was one of the strangest and yet most welcome sounds I had ever heard. When you’re the producer and 4,000 people are in a theater and half of them are sniffling, crying, clearing their throats, and even a few sobbing quietly, all of this is very beautiful music. I knew in my bones we had a hit. Two days later it was judgment day — opening day. I was up early, down at our booking office in Chinatown where everything was organized in a way that was more like an election control room than anything else I can think of. There was a “big board” — a huge white board and across the top were the names of each of the 35 theaters. Then running down the left side were rows for each hour — 11am, 12 noon, 1pm, 2pm, and so on. This created a matrix where, for each theater, there would be an hourly total that would tell us how the film was doing. And, somewhat to my amazement, Jelly explained to me that there were certain theaters that were considered “bellweather” theaters for particular types of films. Thus, for example, we should be able to look at the first hour results form three or four key theaters, and from that, we could project to within a few percentage points, what our week one overall theatrical gross would be. There was more to the system that was intriguing as well. To gather our data, we would have a “checker” in each theater. The checker’s job would be to write down the ticket number for the first and last ticket for each hour, and it would be that calculation that would tell us how many tickets had been sold for that hour. There was always a chance that checkers might be in cahoots with theater owners, so in addition the checkers, there were several roaming undercover “supercheckers” who would travel between theaters, monitoring the goings on, looking for any anomalies. Out of all of this would emerge, hopefully, the portrait of a film about to explode. Eleven AM came and the first reports were called in. I remember in particular there was one theater that we were watching. If we could hit P7,000 for the first hour, we were assured of major hit status. P5,000 would be semi-hit, very profitable, and P3,000 would be so-so. Anything below P2,000 we would be a flop and below P1,000 we were in danger of “First Day Last Day”, a grand Filipino tradition wherein a film that really tanks is yanked after one day. I was sure, absolutely certain, that we were going to hit P7,000 and it was going to be high fives all around. The number was P3,200. Respectable, but not a hit. We were all stunned, but probably shouldn’t have been. We probably should have understood that the huge buzz surrounding the premiere was more about Sharon Cuneta and Robin Padilla and their romance, than it was about our movie. We were, after all, a family drama with a good cast but nothing that could compare with the buzz of the the Sharon/Robin romance, or their mega-blockbuster movie. As a footnote, we did defy “the norm” in one other way. Jelly told me that there was a pattern that was very predictable — that Friday was a certain percentage of the first week, Saturday, Sunday, and then Monday, Tuesday, Wednesday, Thursday — once you knew your Friday, you could pretty much fill in the rest of the grid by applying the formula that indexes off of day one. So of course I did that — I created a spreadsheet and entered the day one totals, then projected the rest, and then as the days went by, entered the actuals. A pattern emerged that got me very excited. We were beating the formula — meaning that after opening day, each day’s “actual” was substantially higher than the formula projected, which could only mean one thing — that we were getting excellent word of mouth, that audiences liked the movie, and maybe there was hope that we could build something here. I of course took my spreadsheet and had Jelly take me all over Escolta to all the theater bookers where — I can now imagine — everyone tolerated this 6’5″ mad American and his spreasheets and frantic exhortations to not only hold the existing theaters, but add more theaters. In the end, I may have saved a few theaters, but by and large my efforts were met with amused tolerance. The film did go on to do about P5M in Metro Manila Box Office, and P8M over all — enough to recoup and produce a modest profit. And over the years it has become a lasting institution on Philippine television, where it still gets replayed regularly today. My first movie was history and I had survived it.